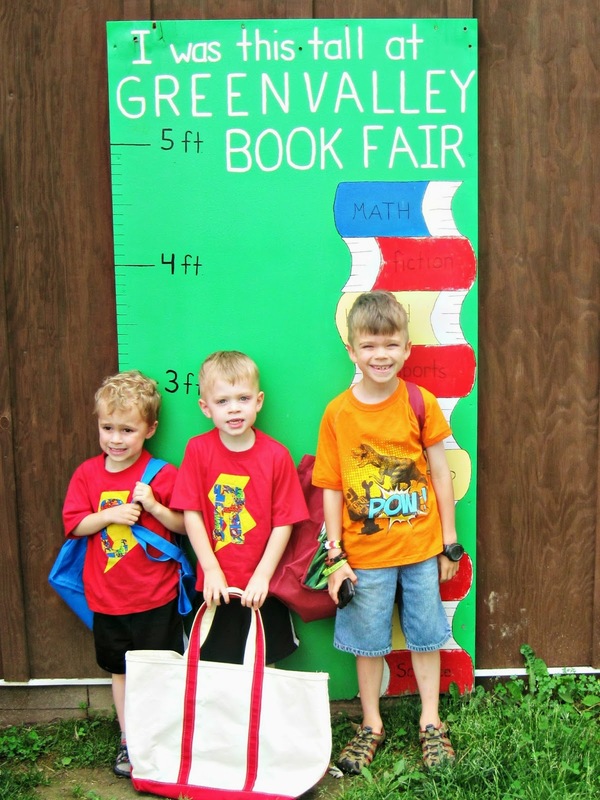 Every year we love to take a trip to the Green Valley book fair. It only runs during certain times of the year. The day school got out for Pierce, we took a drive up there with my mom, who was kind enough to give each of the boys a little spending money. But even better? She supervised them, so I could shop! I stocked up on lots of educational books for the boys to use this summer. We do a little school work every day. I don't want their minds to go completely to waste. After a couple of hours (it is a HUGE book fair - think warehouse), we were starving. 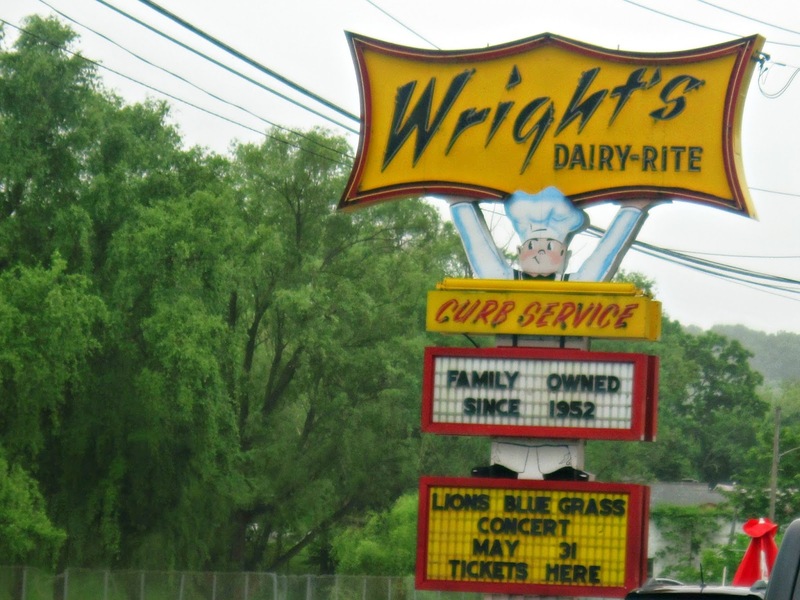 We went to Wright's Dairy-Rite, which has been a dining staple in Staunton for many years. Pierce got to do the honors of placing our order by the phone at our table. He was so excited to get to use it. He did a great job. And later, when my mom needed some cole slaw? We just picked up the phone and told them. Very convenient! The strawberry milkshake I had? Fantastic! We were all so stuffed at the end of our meal that we could barely make the drive home. Cort said, "That was the best day ever!'. Indeed, it was a nice start to summer. What a neat trip for the boys. I remember that Diner, every few months our IT group that covers the whole state would meet there since its basically in the center of Va. I went to the book fair in 1979 when it was located in the old hay barn. New books were in the cellar and used in the top. It was so crowded in the parking lot and building. What a neat trip, they had lots of children's books when I was there last so the boys probably had a hard time choosing what to get. And then a stop at Wrights, what a day! Ordering food over the phone looks like such fun! I used to love to explore the book fair when I lived in Virginia. My daughter has her 4 study during the summer, too. She pinpoints who needs work on which subject and focuses on that topic. Guess that's what they get for having a teacher for a mom. I think it's a great idea, but really liked homework-free summers when I was a kid. That is one cool restaurant. Book fair is my favorite event. Your son look so happy, and I'm sure it must be a very nice day. good idea to keep them in practice. The library here always has a summer read program. I want a wish burger. I just love anything that has books involved. I love a good book fair too; sadly ours are only held at the school once a year. The diner looks like such a fun food event! Oh man! 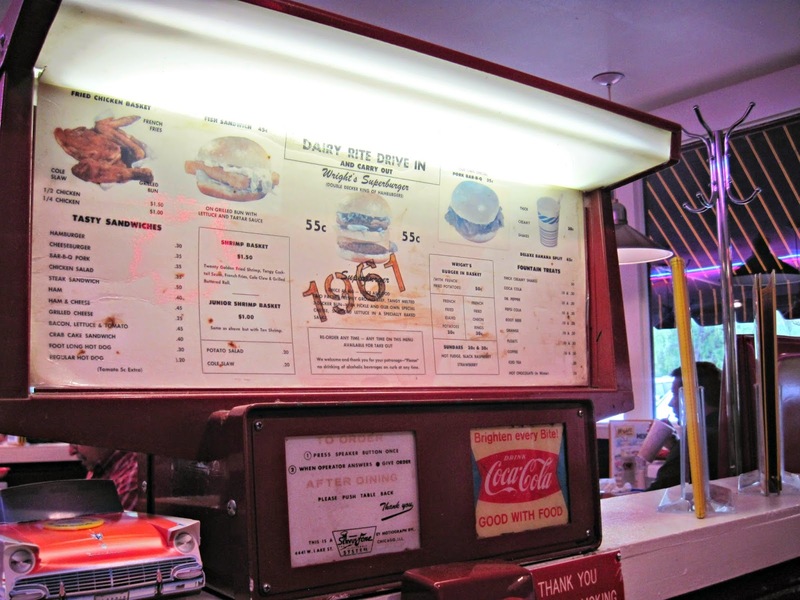 I remember ordering food like that at the "Big T Drive-In" when we lived in Wyoming! Too cool! Sounds like a great day! And so cool that your boys enjoy going to a bookstore. The Green Valley is on my list of "places I need to go." What a cool place to dine! 1961 was a great year...I was born then. Oops, now you know I'm old! Rats! Wrights is practically in our back yard! But you had your mom with you, maybe next month...love the last picture! Aaaand, now I'd want something yummy to eat! I'd have loved to tag along for the best day ever! What's not to love about books and phoning in your order?!? A fun day for each of you! I love summer for these sorts of adventures. Especially when they end in ice cream! Down on the Florida Georgia border there are big warehouse book places. You can stop, browse around and stretch your legs. They have every subject under the sun. Ah, we've been to the book fair many times. Just as you think you're on the wrong road, there it is! Love the photo of the three by the ruler..and diners like that usually have the 'best' of...sounds like a fantastic day for everyone. What a cool little place to dine! I love how they have the yearly menus and the phone. Such a neat concept. My kids would love that!! oh that is awesome! we were going to stop there one day while we were in staunton but we had been walking around in the hot sun and wanted to have something that was cool instead of burgers. one of these days though! Une vie de maman bien remplie mais certainement aussi,des enfants très heureux. Superbes photos. Sounds like a lot of fun. I love educational books. We usually make a family trip to our local book store a few times a year as well. Not as much fun as a book fair though. Looks like a great time was had by all--plus an incredible lunch!!!! I'd love that Strawberry shake also. Looks like a lot of fun. Cool telephone. Nice they had some spending money. I would have loved going. I love books. I like book fairs. We only have been to the ones at the kiddos' schools, but we go to bookstores every time we travel. We are trying to mix in reading and learning this summer as well--and do it in a fun way like you do so well. The phones are certainly a throwback at Wright's. 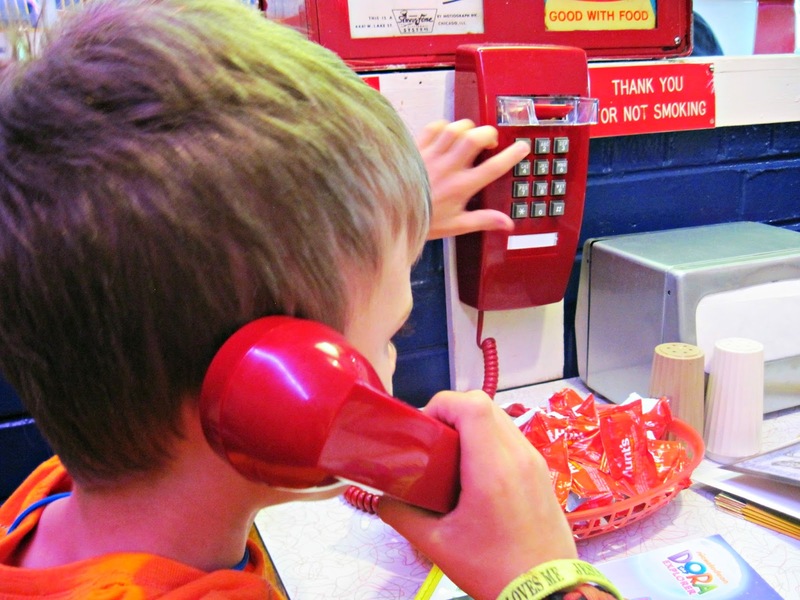 Our kiddos would have lots of fun ordering that way; I' would too until I got the bill.